Congrats, Guido. I just bought a copy and look forward to learning some new tips and tricks. I’ve been using your step-by-step guide through several other books, so I am very glad to buy this. I’ll be reading and recommending it to others. Looking forward to getting a copy. But looking at the Table of Contents, I don’t seem to find anything on Sigil. Or is it covered in one of the topics? Just curious to know. I sincerely believe any tips on eBook formatting will be a great idea. Thanks for the heads-up. Sigil is not covered in the book because it is not a software package I use. The book outlines the process that I’ve been using for years, and breaks it down so that anyone with a bit of technical interest can follow it. At this time, no ePub versions are available. Apple is currently making it very difficult for me to publish the book because I am referencing a lot of their competitors like Amazon and Barnes&Noble in the text. As a result they keep refusing the book. I’ve also run into some hiccups regarding the Nook, which is why I’m still holding back the book on Barnes&Noble. What device are you using? Not a current generation Nook, perchance? It is an amazing book, Guido, and I wanted to thank you for it. 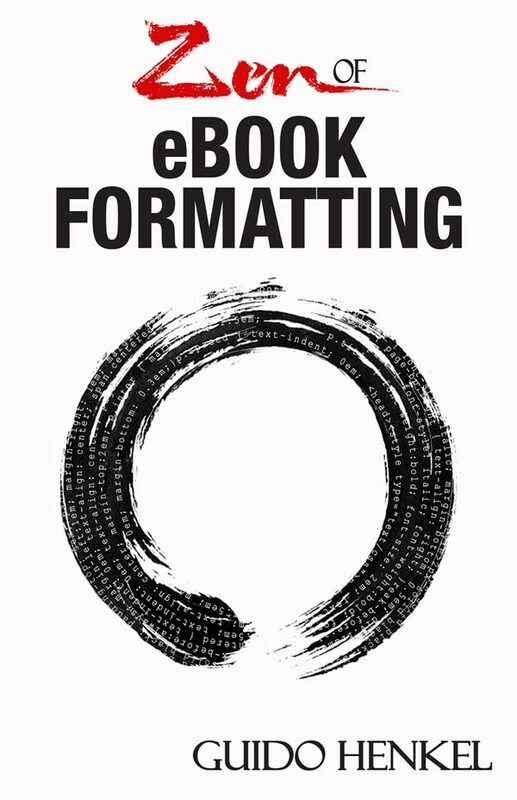 I have been following your guidance (Take Pride in Your eBook Formatting) since I set out to publish my very first eBook. And I have never looked back (nor had any reasons to do so). I have been referring people to your blog series all along and now I’ll be referring them to this book. Thank you so much for your kind remarks. I am so glad that the tutorial series and the book have been so helpful. I’m using a generic ebook reader with no direct connection to any device-specific store, so what I would need is just a standard epub file. If you have PayPal or something like that, I could just send you the payment through that? Thank you for this fantastic book. I purchased my copy today, looking to fine tune my formatting skills, and wow. Somebody on my wavelength! Never thought I’d love a non-fiction book as much as this! EPUB versions of the book are not available on a retail level for a number of reasons. If you would like an EPUB copy, feel free to paypal $5.99 to with a brief note and your email address and I’ll be happy to send you a copy. Thank you Guido! I have just ordered the epub version of your ebook. Guido – just wondering if your new ebook covers epub3 at all? We are finding that some countries only accepted ebooks for distribution in epub3 format. We would like to know if we can easily convert our mostly text epub2 books to epub3 in order to provide these epub3 versions for distribution to these etailers. And is there an epub3 validator tool out yet? The <code> tag is not supported by eBook readers. It is an invention of message boards. You will have to create a custom paragraph style for it and style it the way you want it, preferably using a monospace font. As for the square bullets, as I point out on various occasions in the book-as well as here on the site, there will always be certain things that do not work as expected on certain devices, and there is very little that can be done about it. You will simply have to be flexible with the way your content is presented in the digital world. Guido it is unacceptable that you do not make an ePub version of your eBook available. I make it a rule NEVER to buy proprietary and DRM-hobbled content when alternatives are available. So I will be watching your progress with interest. That said, I wish you well and a pox on Apple’s house for its anti-competitive stance on eBooks and Apps that refer to a competitor. That is petty beyond belief. There is nothing proprietary about the MOBI file format, and the book has no DRM either, so your stance is not really justified. But be that as it may, there is an ePub version of the book available at Barnes & Noble and in Kobo’s store.